Browse > Home / Game Fishing Spots / Game Fishing in Ireland / River Blackwater Salmon Opening Day in Ireland / The First Spring Salmon of 2009 is Caught! 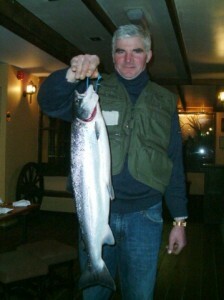 The First Spring Salmon of 2009 is Caught! The first springer of the season on the Blackwater Lodge Salmon Fishery. The fish fell to spinner and weighed 6.7lb.We believe that there may have been four other springers already caught on the private beat below the first weir on the river, which is immediately above our Beat 7, but this is rumour rather than fact. The map below shows the Lodge’s 16 beats on the river. They are spread out from only 3 miles above the tidal limit to over 30 miles further upstream. It is interesting to see the distribution of fish hooked/caught in relation to the geography of the river. The first springer hooked was on Beat 8 – Ballyhooly Bridge (17 miles upstream of the Lodge) on the 1st. February – on fly when there was a 7 foot flood on the river. The second springer hooked was on the top beat which is Beat 16 -: Ballygarrett, which is over 28 miles upstream of the Lodge. That fish was hooked on spinner. The first fish caught (above photo) was on Beat 5 – Inchinleama. The graph shows the rainfall and river height at Upper Ballyduff for January/February. This explains why fish were being hooked so far up the river so early, as they were able to run very far upstream on the high water. The rainfall has abated in the last 10 days, and the river is now coming down to a perfect fly height & clarity. The water temperature is 7°C – 45°F. Absolutely superb for spring fishing in the coming weeks, with springers present and the river in fantastic order. The only reason that more springers have not been caught already is the low fishing effort. There have only been 44 rod days on the fishery in the first 20 days of the season. An average of only 2 rods/day over 14 miles of fishing! which is a very pleasant surprise with the very high concentration of fish in the river. All this bodes well for the stocks of salmon for the future. There is no problem for rod availability on most of the fisheries on the Blackwater at the moment.